Commemorate the first issue of Star Wars! Gorgeous paper giclee art print is a limited edition of 77 hand-numbered pieces. Signed by the artist and measures 22-inches tall x 17-inches wide! Commemorate the first issue of Star Wars! 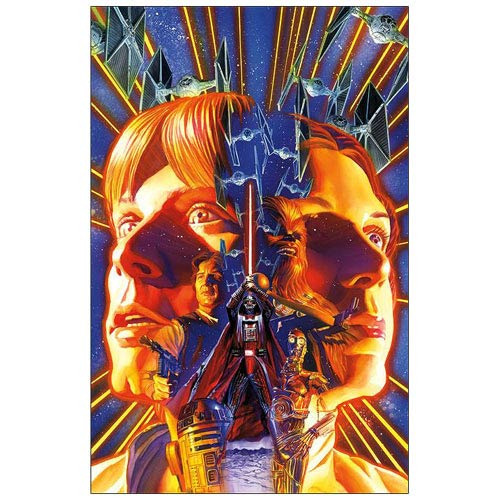 This Star Wars Comic Book Issue #1 Cover Paper Giclee Print is a gorgeous piece of artwork by Alex Ross, who did the artwork for 2013s Star Wars #1 comic book, and features quite the stunning montage image of Luke Skywalker, Han Solo, and R2-D2 on the left side of the giclee with Princess Leia Organa, Chewbacca, and C-3PO on the right side of the giclee, with the two groups being bisected by a mass of Imperial TIE Fighters and Darth Vader thrusting his lightsaber high into the air. All featured on a beautiful space background interspersed by a beautiful array of lasers, this gorgeous giclee has been printed on paper, signed by the artist, and is a limited edition of 77 hand-numbered pieces. Complete with certificate of authenticity, this giclee measures 22-inches tall x 17-inches wide.